The family of Capt. Jahmar F. Resilard speak after he was killed in a training accident off Japan's coast. Military officials say a 28-year-old South Florida man has died in a crash of two U.S. warplanes that collided off Japan's coast. Family members told NBC 6 they were set to meet Resilard in Maryland for Christmas but are now making funeral plans. "For me it’s been bittersweet, you know, again, he lived his dream. 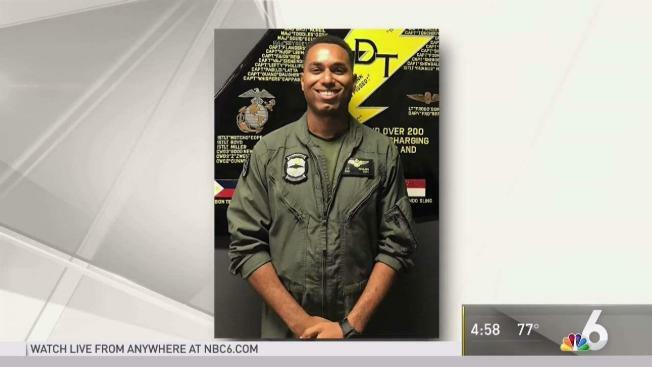 He wanted to be a pilot, not just a pilot he wanted to be a fighter pilot," mother Joni Moore-Resilard told NBC 6 in a phone interview Friday. President Donald Trump tweeted that his thoughts and prayers were with the Marine Corps crew members involved in the collision. He thanked U.S. Forces in Japan for their "immediate response and rescue efforts” and said "Whatever you need, we are here for you." Florida Gov. Rick Scott said he was "heartbroken" to learn of Resilard's death. "The loss of Capt. Resilard is a somber reminder of the danger our servicemen and women both home and abroad place themselves in every day to keep us safe," Scott said in a statement. "The entire State of Florida joins Capt. Resilard’s family in honoring his bravery and legacy of service."